Enhance your home, garden or commercial property with decorative and authentic statuary. It’s not just the beautiful plants and stones that make up a good landscape – statues also help in creating an attractive outdoor space. EG offers a complete statuary line, and one of the most popular designs is the Blessed Virgin Mary Statue. 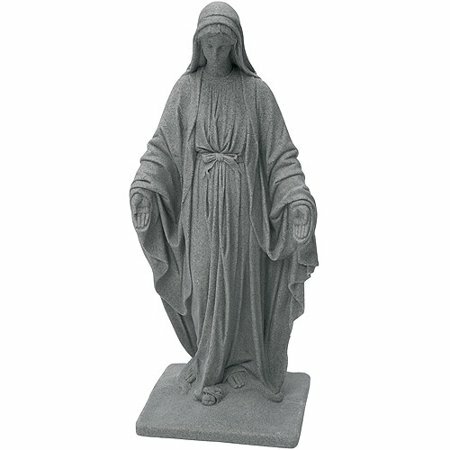 The Blessed Virgin Mary Statue is made of polyethylene plastic, but has a rich and textured granite appearance that makes it look realistic as concrete or cement. The hand crafted casting features a gentle and benevolent, Virgin Mary in flowing robes with arms open. The resin material is durable, ensuring stability in all types of environments, even harsh weather conditions. In addition to durability, the statue is lightweight and can be installed in seconds. Fill with a small amount of gravel or sand to add more weight and stability. With the large size, material, and quality of the Morning Angel Statue, it has a great value for its price. Get this beautiful statue for your yard, front porch, garden or driveway today. EMSCO Group offers a complete line of outdoor statues, with designs that would fit the individuality of any home or commercial property. These statues are sure to add a distinctive touch to any garden or patio. NATURAL TEXTURE AND APPEARANCE – The Blessed Virgin Mary Statue has a natural texture that resembles real stone. Add style to your home décor with this conversational statuary piece, perfect in any lawn, garden, or household. DURABLE RESIN CONSTRUCTION – This statue is manufactured from a durable resin polymer (polyethylene) to replicate a stone statue at a lower price. Fill the statue with gravel or sand to anchor against wind and weather. LIGHTWEIGHT – This sculpture is made of lightweight and durable polyethylene. Instead of a heavy, expensive concrete statue, this statue can be effortlessly carried and installed in seconds – no more back breaking work and lifting! ENHANCES ANY LANDSCAPE – Enhance landscapes and exteriors. 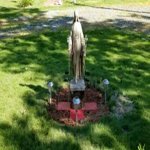 This Blessed Virgin Mary Statue comes in several finishes including sand, granite and bronze: Great for the garden, patio, driveway, porch or landscape projects. They arrived in good condition and very fast, they look the same as they did on the computer. Great buy I have always wanted these and finally Brock down and bought them. Great deal. Looks like real stone. Perfect size for my garden. So far she holds up great outdoors. I placed her in between my rose bushes and received so many compliments. This resin statue is far better than concrete statue s I have purchased in the past. It can hold up to the elements much better and you really have a difficult time realizing it is not concrete! The details are great, and the size is a bonus ,most statues this size would be very costly .It is a BEAUTIFUL statue,you will not be disappointed. Just fill it with a 50lb bag of sand and it's ready to go. I've wanted a statue for ages and finally purchased this one. I was totally surprised by how lightweight it is! That's great for moving it around but I'm keeping it on my front porch to avoid it blowing over or out of my yard! Very nice appearing - looks like stone. 1. This item measures 32-1/8 inch in height. How tall is this column? 1. The height is 32.25''.